54W – 1200mm/48”(l) – 5/8”- 16 mm (w) BLUE MARINE ACTINIC 420nm - Lighting with a higher blue component better simulates the softer shades of dusk, dawn and the blue hue of deeper water. Rio 400, Vision 450. 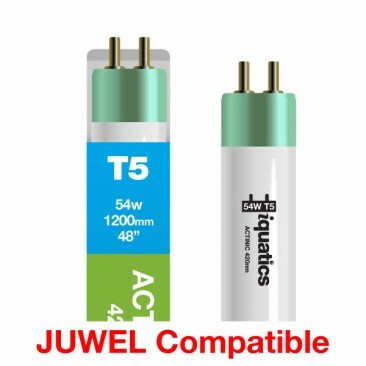 These T5's are also compatible with the Aquatlantis range of T5 Lighting. Our Blue Marine Actinic has specially selected phosphors producing actinic wavelength within the 420nm range of the spectrum thus enhancing the fluorescent colours in your corals. With the slight purple/blue hue appearance deeper penetration is gained due to the spectrum not being absorbed by the salt content in your aquarium. Your tank may not appear as bright but the light it gives out has wavelengths specific to ideal growth conditions rather than containing the (useless for photosynthesis) wavelengths which the human eye perceives as a bright light. The Marine Blue Actinic tube would ideally be used in conjunction with the iQuatics Marine White 14000k to help balance out the yellow hue to bring out the natural beauty in your aquarium. What is actinic lighting ? BLUE MARINE ACTINIC 420nm - Lighting with a higher blue component better simulates the softer shades of dusk, dawn and the blue hue of deeper water.